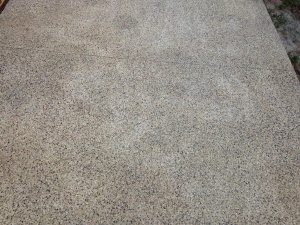 A closeup photo of properly sealed exposed aggregate concrete illustrating the color variation in stone, and "wet look" from the protective sealer. Exposed aggregate is a finish for exterior concrete that has been around for a long time but has seen a significant resurgence in popularity over the past five years. Although technically not considered "decorative concrete", it's a nice look whose appeal resides in the use and exposure of fine aggregate, like sand and quartz, and medium aggregate, particularly round "pea gravel", of varying colors, at the surface of the concrete. This "natural stone" look is enhanced upon application of clear sealer to protect the concrete, which deepens the color tones, and provides a "wet look". Exposed aggregate concrete is similar to "polished concrete" in this respect. The main differences are that exposed aggregate is used outside, and consists of a rough and uneven finish, for slip resistance in wet conditions, while polished concrete is used inside, and is ground flat to provide a more finished look, and to ease maintenance. A third significant difference is that exposed aggregate, because it is outside and subject to direct sunlight and harsh weather conditions, needs to be resealed more often than polished concrete. Intense UV rays from the sun, repeated wet-dry cycles, and periodic freeze-thaw conditions quickly break down even the most durable of clear sealers. 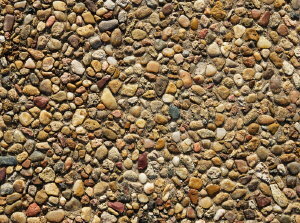 Improperly sealed, exposed aggregate concrete driveways often take on a blotchy, dull look after even just one winter. If you just reseal over this, without stripping first, it won't go away. Herein lies the problem: sealing - and resealing - exposed aggregate concrete is tricky. It requires not only a high quality sealer, but experience, attention, and finesse. The surface of exposed aggregate is undulating, and due to the differing texture of stone (pea gravel), and cement holding the stone together, varies widely in porosity. This makes it very easy for sealer to build up excessively in some areas, and be applied too sparingly in others. The result is exposed aggregate concrete on driveways, porches, patios and pool decks that doesn't look the way it was intended. Typically, it will appear blotchy, and with alternating bands (or "stripes") of dark and light areas. This contracting crew is obviously having fun applying sealer to exposed aggregate concrete, but they aren't doing it the right way, and they aren't paying attention. Compounding this challenge, most concrete contractors installing exposed aggregate, while skilled at creating a nice finish, are not particularly adept at applying sealer. They often use the wrong type of sealer, or an inexpensive product with medium to low grade resin. More often than not, they also use the wrong application technique - rolling instead of spraying. And they work in haste, because the majority, and most labor intensive part, of the work - placing the concrete - has already been done. The contractor and his crew are anxious to get on to the next project. 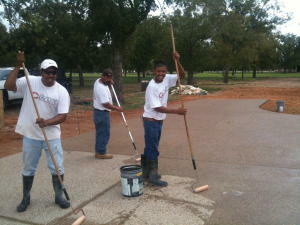 We see this routinely at homes where we are bidding on or installing decorative concrete flooring. One of our recent customers with an exposed aggregate patio, even told us how he gave up all hope of getting his patio sealed the way he wants, stripped and power-washed all of the sealer off, and plans to leave his patio completely unsealed from now on. This doesn't have to be the case. Exposed aggregate concrete can look good in the beginning, and it can be maintained that way indefinitely - as long as sealing, and resealing is done properly, and with a high quality clear concrete sealer. This beautiful exposed aggregate driveway was properly sealed with a Brickform product and doesn't show a trace of blotchiness, bands of dark areas, or dullness. Premier Veneers is trained and experienced in properly applying sealer to exposed aggregate concrete, and we take pride in our work. We realize that it doesn't matter how well you place concrete, or install a decorative finish or treatment, if you don't use a high quality sealer, and apply it properly, so as to enhance and preserve the decorative concrete flatwork, or flooring, far into the future. We realize that if our customer is happy when we leave, but their project quickly deteriorates soon afterward, that reflects badly on us. That's why we use one of the best sealers available for sealing, and resealing, outdoor exposed aggregate concrete: Gem-Seal, a solvent-based acrylic lacquer from the decorative concrete manufacturer, Brickform. We also use a high quality pump up sprayer with solvent-resistant gaskets, rings and seals, equipped with a special 120-degree fan tip, to apply the Gem-Seal sealer so that it goes on lightly and uniformly, dries quickly, doesn't bubble in hot temperatures, and doesn't build up so excessively that it turns white when it gets wet, or gradually flakes off due to harsh outdoor weather conditions. This sample from a recent Brickform contractor traininng demonstration shows how great exposed aggregate can look with properly applied sealer, and a stenciled pattern. With Spring here, and weather conditions improving, we know that many homeowners are thinking about resealing their exposed aggregate, or stamped, concrete driveway, porch, patio or pool deck. The best advice we can give, for the outcome to look great and last longer before the next reseal, is to hire someone that specializes in applying sealers, like a Brickform contractor. Premier Veneers specializes in sealers, and other high performance coatings, and we are a Brickform contractor. You can see our Brickform contractor listing at MyConcreteContractor.com .